Over the last decade, as the state fought federal efforts to protect water, shrunk its own environmental and water-management agencies, and cut funding to an algae task force, monitoring for water quality has plummeted. State scientists sample water in the lake, but too infrequently to track rapidly evolving algae blooms. Instead, Havens had to rely on satellite images that were taken on sunny days when clouds don't get in the way. "No one is out on the lake collecting water samples of the bloom," he said last month. "We're flying blind." Over the last decade, as the state fought federal efforts to protect water, shrunk its own environmental and water-management agencies, and cut funding to an algae task force, monitoring for water quality has plummeted. 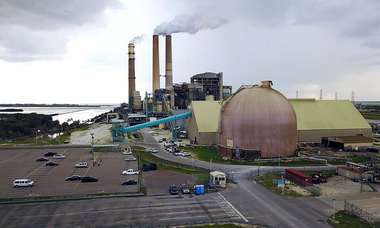 While one crisis after another hit Florida, state and federal funding that paid for a massive coastal network with nearly three decades of information dwindled from about 350 stations to 115, according to Florida International University's Southeast Environmental Research Center. That included Pine Island Sound, which is ground zero for the worst of the current red-tide fish kills and is where sampling was halted in October 2007, and shutting down a 49-station network that was across the Florida Shelf and started in 1995. The Florida Shelf is adjacent to Florida Bay, between the Keys to the south and Ten Thousand Islands to the north. In 2014, the state cut funding to about 30 percent of the stations in Biscayne Bay where half the seagrass has died in the last six years. The feds also scaled back: In 2012, the Environmental Protection Agency dropped 43 stations in the Florida Keys National Marine Sanctuary where a mysterious coral disease is threatening reefs. 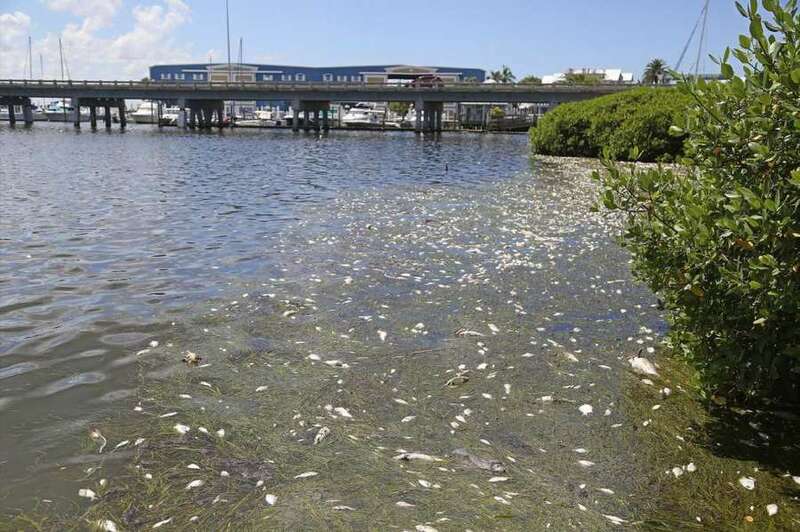 Better monitoring alone wouldn't have spared the state from a summer-long algae bloom on the lake choking the Caloosahatchee River with blue-green slime and a red tide dumping dead fish, sea turtles, and other marine life on the west coast. Both are fed by too much pollution. But better monitoring could have provided more warning about the lake and critical information for better understanding and fighting red tide and other water woes around the state. "I am very worried because we are doing a lot of things in the Everglades with all this restoration and some of the changes I don't feel we are tracing," said Florida International University geochemist Henry Briceño, who oversees the coastal network and sparred with Miami Beach officials three years ago over stormwater polluting Biscayne Bay. "Right now, when we have something going on in the Florida Keys, we don't know where that's coming from." 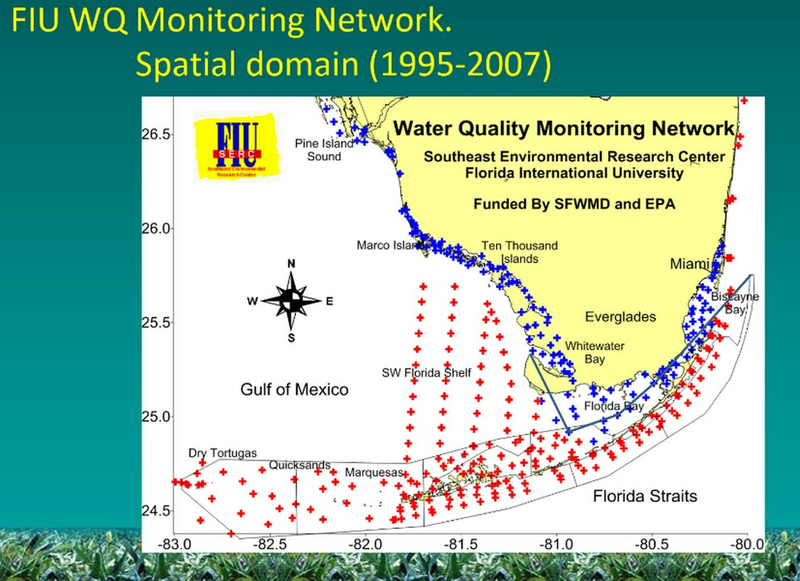 Beginning in 1995, a coastal monitoring network covered much of South Florida. The state paid for much of the coastal monitoring, marked in blue, while the Environmental Protection Agency funded stations marked in red. Between 2008 and 2014, the South Florida Water Management District eliminated monitoring along Southwest Florida and Biscayne Bay. 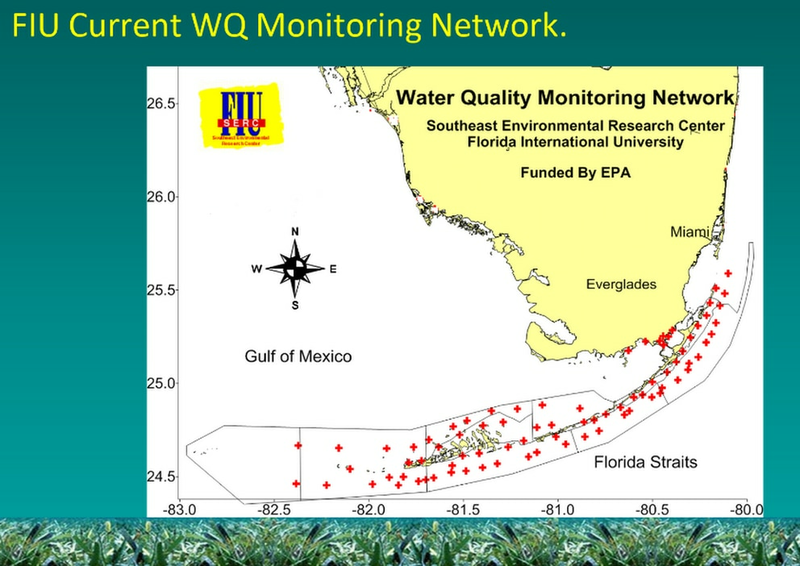 In 2012, the Environmental Protection Agency also ended scaled back monitoring, including a large network on the Florida Shelf. And that has left officials scrambling and defensive amid the ongoing algae blooms. Gov. Rick Scott — who ordered budget cuts to water-management agencies for five consecutive years and dismantled the Department of Community Affairs, which regulated growth and agreed to postpone cleaning up the lake — issued a press release saying his administration had spent millions on red-tide research, including $5.5 million awarded to the Mote Marine Laboratory since 2013. Last month, he issued a state of emergency, ordered more sampling, and lifted restrictions for temporary pumps and other measures to avoid polluted discharges from the lake. Sen. Marco Rubio also introduced legislation last month to give the Environmental Protection Agency $5 million to study algae blooms, while Sen. Bill Nelson has asked the Centers for Disease Control to investigate health risks from exposure to the lake- and coastal-algae blooms. But playing catch up now doesn't get to the root of the problem, scientists say. And cuts could impede efforts to protect Florida: Last month, the Public Employees for Environmental Responsibility, which tracks environmental enforcement, said the state had the second worst year for enforcement since 1987. Because monitoring is often subcontracted to research universities or divvied up among various government agencies, it's hard to determine exactly how much has been cut. The Department of Environmental Protection, the Department of Health, and the state's wildlife agency also conduct sampling. But scientists contacted for this story agree that money has dried up. "The water-management district is not doing as much monitoring as they used to," said University of Miami Rosenstiel School of Marine and Atmospheric Science phytoplankton expert Larry Brand. "They have a huge network and used to have a great data set and now it's no good anymore. Same with [Miami-Dade County]. There's not as much data around as you used to have." The district, which is overseeing the $16 billion Everglades restoration project, maintains a massive database with stations stretching from lakes south of Orlando to the tip of the Florida Bay. But the stations are operated under an annual plan that has resulted in inconsistent sampling and focuses largely on nitrogen and phosphorus. "When you have an event like the blooms, that is additional sampling that probably isn't listed in the original plan because you didn't know whether or not you'd have that," said spokesman Randy Smith. "A lot of the monitoring we do is related to court cases that list specific GPS locations and the frequency they must be monitored. It's a combination of things." District scientists check 13-14 lake stations monthly for levels of chlorophyll, an indication that a bloom might be forming, and send the results to the state's environmental regulators, Smith said. But that's not enough to understand the life and evolution of a bloom, or when and where it forms, Havens said. It's also far less than what's needed to build a forecast model like the kind that Ohio scientists created to provide seasonal bloom forecasts for Lake Erie, where drinking-water supplies are regularly threatened by toxic scum. "Once a month is a real problem," said Rick Stumpf, who is an oceanographer at the National Oceanic and Atmospheric Administration and helped develop the model. "Data allowed us to work out the models." Building a similar model for Lake Okeechobee is do-able, he said, but would need to factor in many variables since the lake not only gets fouled by run-off and stormwater, like Lake Erie, but has years of polluted muck that is sitting on the shallow bottom and is easily stirred up. "There's a risk that someone could throw a bunch of data into a statistical blender and out pops something that looks like an answer and it really isn't," he said. The water-management district, previously run by Scott's former general counsel, has also come under fire for selective monitoring that paints a rosier picture of conditions. Last year, when an Everglades canal flushing water from farm fields began polluting Miccosukee tribal land, the district stopped monitoring near the canal. The district said the sampling was part of a project that ended. But the tribe accused the district of trying to cover up the pollution as it prepared to ask a federal judge overseeing Everglades restoration to ease water-quality standards. In the 1990s, when he worked at the district, Rick Bartleson, who is a research scientist at the Sanibel-Captiva Conservation Foundation and studies red tide, said he proposed a project to model algae blooms and intentionally left out the lake. "I knew that would hurt my chances," he said. One of the hurdles that scientists face is cost. To maintain a reliable data set, researchers need to follow the same protocols and repeat sampling frequently. Seagrass monitoring, for example, has dropped to once a month in places, not enough to track or understand changes. "The more water-quality data you have, the better off you're going to track how those projects are affecting Florida Bay and elsewhere," said Margaret "Penny" Hall, a seagrass biologist at the state's Fish and Wildlife Research Institute. "But it's really hard when you're trying to pay for the projects themselves. Everybody's just doing their very best with less and less money." "Doing the same thing over and over again for years is usually boring. I know it is," he said. "But what happens is that data is used by thousands of people around the world and to understand problems somewhere else, too." The data FIU collected, for instance, helped Florida develop Everglades water criteria that were eventually adopted by the EPA. After another massive red tide in 1996 killed 151 manatees in the midst of a national scare by a different toxic algae that left dead fish pocked with lesions, lawmakers passed a law that created a harmful-algae-bloom task force. The legislation resulted in the state's Wildlife Research Institute tracking and issuing weekly forecasts for Florida's seasonal red tides and called for the task force to come up with ways to minimize blooms and respond once they hit. But then lawmakers began cutting money, according to a 2009 report. When his group lobbied lawmakers this year to reinstate funding in light of the repeated major blooms triggered by lake releases — in 2005, 2013, 2016, and again this summer — Calusa Waterkeeper chief scientist John Cassani, who monitors water quality on the Southwest coast, said he and his colleagues were told there wasn't money in the budget. "Why aren't we effectively monitoring waterways so we can predict when a bloom is occurring? And why is there so much confusion over what state agencies are responsible for issuing public-health advisories and, most importantly, posting signs at the waterways themselves?" he asked. "It's almost like Florida doesn't want to know it's coming." 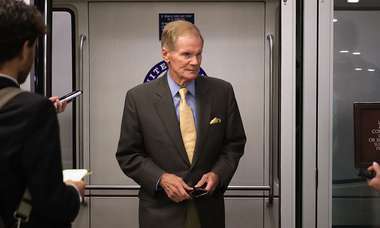 The former Florida Senator finally speaks.